“Since my disability I had lost confidence in myself because I believed that I was physically weak and restricted. Prior, I was in exceptionally good physical condition and I was a biker. Are you one of the many Veterans who bravely fought to protect our country and now face life changing challenges? AMBUCS believes you should have every opportunity to engage in the active lifestyle you enjoyed prior to your service. We understand that some wounds are visible and some are not. 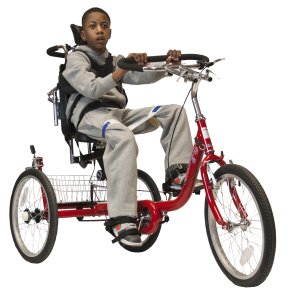 If you are unable to operate a traditional bike, for whatever reason, the Amtryke adaptive tricycle may be for you. Riders with challenges to mobility and independence often struggle to bring a bicycle up to speed quickly enough to stay upright. The Amtryke operates from a tricycle platform with the goal of getting a rider balanced and feeling secure. 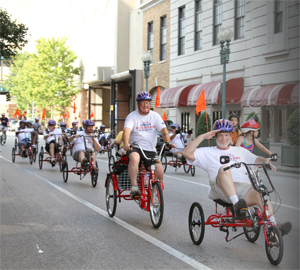 These trykes can be hand or foot powered and provide the stability and support often required for a Veteran to return to bike riding. From sleek road trykes for those who just need help with balance to full trunk support, leg assists and hand assists for more involved riders, the Amtryke has our nation’s heroes covered! 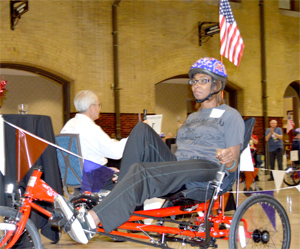 Communities all over the nation are joining together to form AMBUCS chapters focused on providing Amtrykes for Veterans who cannot operate a traditional bike. Whether you are a Veteran, active duty personnel, military friend or family, part of a Veteran support organization or an engaged citizen, we would love to talk to you about starting a sustainable Veterans Initiative Amtryke Program in your community. It’s easier than you may think and a deeply rewarding form of service. The first step is to request a Road Show. We will come to you with a trailer-full of trykes and adaptations, free of charge. We’ll show you how to fit Veterans to the best riding solution and bring a Veteran-focused Amtryke program to your community. Here are some remarkable letters of support from therapists, staff at the VA, Veteran Amtryke recipients and AMBUCS members we gathered while applying for an Adaptive Sports Grant from the VHA. National AMBUCS has a Memorandum of Agreement with the United States Department of Veterans Affairs Veterans Health Administration. Are you one of nearly 600 veterans who already own an Amtryke? Please consider joining one of our riding clubs! We are hard a work building riding clubs in local areas. Here is our first group that’s up and running (with more to follow)! 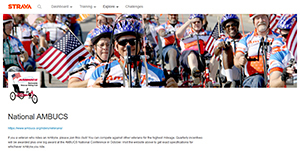 Veterans who ride Amtrykes are also encouraged to join the National AMBUCS Veteran Riding Club on Strava. Here’s a perfect opportunity to set personal riding goals and pit your riding mileage against other veteran Amtryke riders! We plan to give quarterly incentives for the highest mileage and a yearly award at AMBUCS National Conference in the fall. Veteran setting up a personal Strava page. Amtryke details for setting up your bike in Strava. If you are an AMBUCS chapter that has a riding club and would like to be listed here and/or would like directions for setting up a local riding club on Strava, please contact Angela Labrecque.